Home / Gists / Taaty Billion for the account! Davido reveals how much he spent in one night! Taaty Billion for the account! 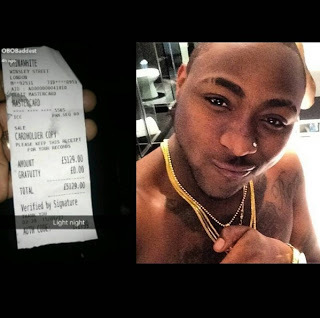 Davido reveals how much he spent in one night! Sony Music Act and DMW Boss aka OBO- Davido shared how much he spent while clubbing after his One Africa Show in London. The image above shows that the "If" crooner spent almost 5k pounds on drinks (Approx 2.5 million naira) IN JUST ONE NIGHT! If he can do this, then there's definitely "TAATY" billion naira in the account.